Range – Alaska south to coast mountain ranges and Sierra Nevada Mountains of California, east to Montana (Stewart 1994). Climate, elevation – Stream violet is found in the lowland to subalpine zones. Local occurrence (where, how common) – The species is common throughout the mountains of the Pacific Northwest (Taylor and Douglas 1995). Habitat preferences – Stream violet inhabits roadside ditches, streams and seepage areas in moist to wet subalpine meadows (Taylor and Douglas 1995) and boggy ground in forests (Stewart 1994). Plant strategy type/successional stage (stress-tolerator, competitor, weedy/colonizer, seral, late successional) – Stream violet is tolerant of shade. Associated species - Associated overstory species include Sitka spruce (Picea sitchensis), mountain hemlock (Tsuga mertensiana), Alaska-cedar (Chamaecyparis nootkatensis), lodgepole pine (Pinus contorta), and western white pine (P. monticola). It may also grow with hardwood species such as maples (Acer, spp. ), birches (Betula spp.) or red alder (Alnus rubra). Understory associates include western swordfern (Polystichum munitum), false lily-of-the-valley (Maianthemum dilatatum), evergreen violet (V. sempervirens), red huckleberry(Vaccinium parvifolium), devils club (Oplopanax horridum), salmonberry(Rubus spectablis), and thimbleberry (R. parviflorus). May be collected as: (seed, layered, divisions, etc.) – Seed or divisions from rooted pieces of the stem. Collection restrictions or guidelines – Since it has explosive seed capsules, seeds will carpet the ground (take care when harvesting seed). Seed germination (needs dormancy breaking?) – Seeds do not need dormancy breaking. Seed life (can be stored, short shelf-life, long shelf-life) – No information was found on this topic. Recommended seed storage conditions - No information was found on this topic. Propagation recommendations (plant seeds, vegetative parts, cuttings, etc.) The easiest way to plant stream violet is from rooted pieces of the stem (Hebda, 2003). Division should be done in the autumn or just after flowering. Larger divisions can be planted out direct into their permanent positions, though it is best to pot up smaller divisions and grow them on in light shade in a greenhouse or cold frame until they are growing well. Plant them out in the summer or the following spring. Seed - best sown in the autumn in a cold frame, or directly after collecting in the spring. Prick out the seedlings into individual pots when they are large enough to handle and plant them out in the summer. Soil or medium requirements (inoculum necessary?) - Prefers a cool moist well-drained humus-rich soil in partial or dappled shade and protection from wind. Tolerates sandstone and limestone soils but becomes chlorotic if the pH is too high. Prefers a pH between 6 and 6.5 (Huxley 1992). Installation form (form, potential for successful outcomes, cost) – Plant in a wooded site where the canopy consists mainly of deciduous species like maples, birches or alder. The easiest way to propagate stream violet is from rooted pieces of the stem. Plant these in the fall or spring. It also sprouts readily from seed. Sow the seed in the fall or find seedlings early in the spring (Hebda 2003). Recommended planting density – Stream violet is easy to plant and may make a colony within a few years (Idaho Native Plant Society 1999). Therefore, do not plant it too densely. 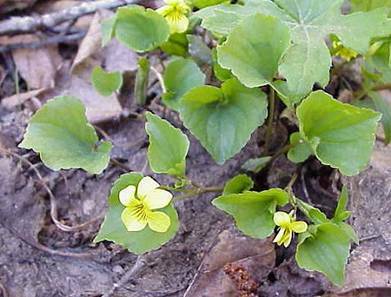 Normal rate of growth or spread; lifespan – A few individuals of stream violet can create a colony within a few years (Idaho Native Plant Society 1999). Idaho Native Plant Society. 1999. Native Plants of Northern Idaho for Landscaping and Restoration. White Pine Chapter. Taylor, R.J. and G.W. Douglas. 1995. Mountain Plants of the Pacific Northwest. Mountain Press Publishing Company. Missoula, Montana.